So you've got some heat issues that you think are just a little too critical for our standard exhaust wraps.. Worry no more! 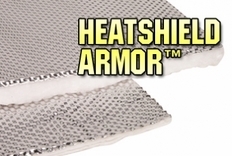 Heatshield Products, Inc. has rolled out a new product called HP Armor. It's designed to be used on headers, turbo manifolds, down pipes exhaust pipes or whatever else you need to protect. Get ready to control heat in a big way.